FLIR Systems reports on an academic journal paper, written by researchers Dr. Alexandros Charogiannis, Dr. Ivan Zadrazil and Dr. Christos Markides at the Department of Chemical Engineering, Imperial College London (London, UK), that describes a novel, combined IR thermographic and velocimetry technique for the investigation of multiphase flows. Liquid-film flows are open-flow systems that can exhibit a rich spectrum of complex wave regimes, flow transitions and dynamics. Ongoing research into these flow systems is motivated by a strong desire to harness the already excellent high heat and mass transfer capabilities of these flows in the broad range of engineering and industrial applications in which they are employed. Examples of such applications include cooling schemes used in electronic and mechanical systems, heat exchangers, film condensers, evaporators and reactors. The paper describes a new technique, termed ‘thermographic particle velocimetry’ (TPV), which is capable of the simultaneous measurement of two-dimensional (2-D) surface temperature and velocity at the interface of multiphase flows. The TPV technique relies on high-resolution IR thermography measurements taken at high frame-rates using a FLIR X6540sc IR camera and is based on the employment of highly reflective particles which, when suspended near or at the interface, can be distinguished from the surrounding fluid domain due to their different emissivity. The Imperial College London researchers used a series of image processing steps to recover the temperature and velocity distributions, including the decomposition of each original raw IR image into separate thermal and particle images, the application of perspective distortion corrections and spatial calibration, and finally the implementation of standard particle velocimetry algorithms. This procedure is demonstrated by application of the TPV technique to a heated and stirred flow in an open container. In addition, two validation experiments are presented, one dedicated to the measurement of interfacial temperature and one to the measurement of interfacial velocity. The results generated by the TPV technique are shown to correlate well with data generated by conventional techniques. A copy of the academic journal paper may be downloaded by visiting here. 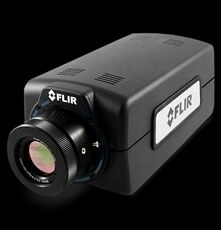 The X6540sc IR camera from FLIR Systems provides ultra-fast frame-rate acquisition for scientific and research applications involving dynamic thermal events. The device features a 640 × 512 digital InSb detector with spectral sensitivity from 1.5 to 5.5 µm and a f/3 aperture. 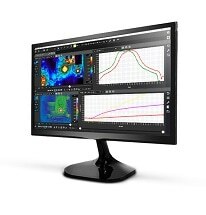 It provides images up to 125 Hz in full frame and up to 4011 Hz in a 64 × 8 sub-windowing mode. Features on this research grade camera include high thermal sensitivity, snapshot imagery, a motorized spectral filter wheel and a detachable touch-screen LCD. The camera connects to the company’s ResearchIR Max R&D software for thermal imaging data acquisition, analysis and reporting. The X6540sc can be temperature-calibrated up to 300 °C, or up to 3000 °C with spectral and/or neutral density filters, and it provides measurement accuracy of ±1 °C for standard configurations. 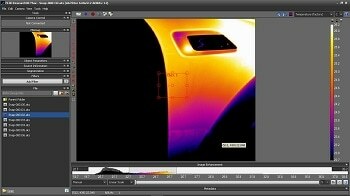 For further information on the X6540sc IR camera visit hereor contact FLIR Systems on [email protected] / +32-3665-5100.